In 1952, Stoughton, Wisconsin held its first Syttende Mai celebration. This recognition of the Norwegian Constitution Day was to become a tradition in the community. Mr. Albert Molderhauer was the administrator of the schools at the time. He was of German ancestry, but felt that because the area was primarily populated with second and third generation Norwegians, the schools should play an active part in supporting ethnic pride in Stoughton. He approached Jeanne Reek (English ancestry), the girls' physical education teacher, and prevailed upon her to begin a Norwegian dance group made up of high school students. The group would be expected to perform during future Syttende Mai celebrations. Ms. Reek was reluctant to undertake this task, as she had limited folk dance background and little knowledge of Norway and its customs. However, because in those days, one didn't question authority, she began the program. That first year, she choose six girls who in turn chose their partners to form the first group. The group began by practicing during their lunch hour. In order to put in more time they began holding practices at 7:00 a.m. Since the early years the group has grown to 20 dancers and three keyboardists. Practices are now held each morning from 6:55 a.m. to 7:40 a.m.
By the third year of their existence the interest of the school and community grew to such extent that Ms. Reek felt she must uncover all there was to know about Norway and its customs. She advanced the performance level of the troop through talks and interviews with Norwegians but found very little recorded information about folk dancing. In the summer of 1964, she went to Norway to gather information first hand. She spent seven weeks there filming folk dances, getting translations to accompany the films, exploring costume shops and taping music. Other people in the community helped in developing these authentic folk performances. Shirley Ralph (Welch ancestry) has worked on recording on paper the music to accompany the dancers. In the beginning years, accordions were used, but today, the dancers are accompanied by keyboardists. Alma Tenjem played an important role in copying, designing, embroidering and constructing costumes. The first costumes were all hand made in Stoughton with materials that were available in the United States. Today, the bunads continue to be constructed in Stoughton, however, all the patterns, fabrics and threads are imported from Norway so that all the bunads are authentically Norwegian. Even the shoes and jewelry are imported from Norway! The girls wear bunads representing different districts in Norway, while the guys all wear the same. In 1968 they were asked to dance for King Olaf of Norway when he visited Madison. Ms. Reek returned to Norway in 1971 to do more research. The following year a highlight in the Dancers career came when they were invited to perform in Norway in and around Bergen and Oslo. With the support and assistance of talented community members, school personnel and parents, the Stoughton Norwegian Dancers have become Stoughton's "Good Will Ambassadors". They have performed for millions of people. They have toured extensively throughout the United States, Canada and Norway and have been in several national folk festivals. Each spring takes the Dancers to a different part of the country. The group has made 5 tours to Norway. Each year many students in Stoughton try out for the nine to ten vacancies in the group left by graduating seniors. Being a Norwegian Dancer is held in high regard among the students and community. The students who are members of the group are pleased to have the opportunity to bring to each of you a little of the traditions of Norway. If you are interested in bringing the Stoughton High School Norwegian Dancers to your community please Contact us for more information. 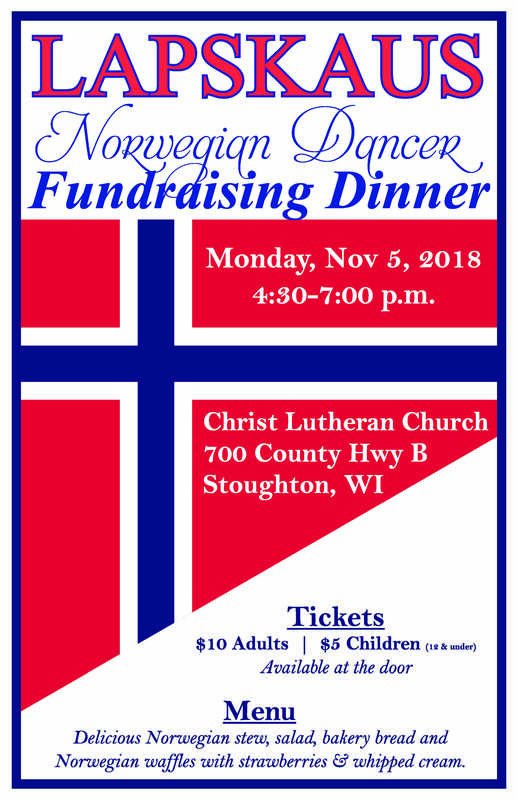 View upcoming performances of the Stoughton High School Norwegian Dancers. To bring The Dancers to your community visit our 'Bring Dancers to Your Community' page.